The convergence (and crash) space for all anti-G20 action has been reclaimed and is almost ready for the summer of Rage! The occupiers haven’t got the lecky on yet, but they’re safely barricaded deep inside. The large ex-pub on the corner of Paul St and Blackall St, EC2A, nearest tube old street. TEAR DOWN THE WALLS! RAISE THE ROOFS! On April the 2nd the world’s leaders are meeting in London for the G20 summit. In the wake of the banking crisis, they are meeting to try to salvage a tottering system, which is aimed at growth for its own sake, at the expense of our living standards and the environment. However, this strategy seems to be failing and the system cannot achieve the rates of growth necessary for its very functioning and continued survival, relying on credit to stave off its collapse. Do the leaders of the world remember that the credit crunch originated in the “housing bubble” and the mortgage crisis?!! Despite Gordon Brown’s claim that the economic crisis is all the fault of US sub prime mortgages, the same trends were apparent in the UK credit boom as commercial banks turned themselves into investment banks and triggered speculation on the housing market. The credit boom was increasingly underwritten by mortgage finance, leading to an unlimited amount of money chasing a finite housing stock. Housing prices rose by 150% between 1996 and 2008, when they finally peaked: in 2004 staggering 63,000 mortgages were granted here at a price 10 times greater than the applicant’s income. In 2008, there have been 40,000 home repossessions across the UK and current estimates for 2009 are in the order of 70,000-75,000! In this session we present some activist and academic understandings of gentrification. We investigate how gentrification evolved in the last couple of decades around the world and in Amsterdam. More specifically we want to show how the policies of the government of Amsterdam contribute to gentrification and how these policies undermine the idea of a just city. What is the role of housing corporations and private developers? How does “splitsen” affect gentrification? The immediate goal is to arrive at a better understanding of the process of gentrification but ultimately our goal is to stop the process. Recently a number of squats have been evicted only to be filled with anti-squat. At first the evictions came about due to a 429 decision, or a flimsy and/or vague renting contract. The house won&#8217;t be used and anti-squat got put in. Recently it seems that, now that evicting on 429 has been put on hold some judges are open to rule to evict on even more dubious grounds like in this case, and other cases on an anti-squat contract. We oppose this because the buildings are not put to proper use but become almost empty again with the minimal occupation by only a few anti-squatters, while if they remained squatted, many more people could live in and make use of the space. Also it seems almost as if the courts consider an anti squat contract to be considered use. This is why we wanted to organize a discussion/brainstorm evening to formulate plans relating to this fucked up practice, addressing not only the real estate owners, but also the juridical system, and the politicians, whose actions and decisions seem only to favour the anti-squat business. We also want to use this evening to formulate ideas, plans, and campaigns, against the anti-squat agencies. You want to do something about anti-squat? Then this is your chance! This discussion/brainstorm evening is the first in a row about squatting related issues. Evenings about article 429 and the looming threat of the law for a ban on squatting will follow. Today the 21 of march we squatted Piet Heinkade 2 and De Ruyterkade 153-157 on “het Ij” which are part of the recently built bridge on the level of the Muzikgebouw behind Central Station. Those two spaces have been remained empty and unused since their construction or rather the construction of the bridge in 2004. The owner of the whole complex is the City Amsterdam, but the 2 squatted places are additional owned by Woningcooperatie Ymere. We are planning to use the space as an autonomous social center, where workshops, info evenings, movy evenings, peolpe’s kitchen, bar, bike repair shop, library and distro, silkscreening and many more activities will take place (see the programm for the first week below). 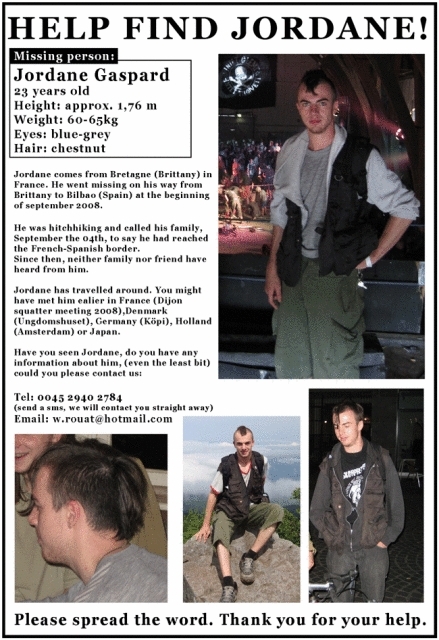 Jordane (his photo on the poster below) is from Brittany in France, he went missing on his way to Bilbao in Spain. he was hitchhiking and called his family on 4th September 2008, from the French-Spanish border. Since then, neither family, nor friends have heard from him. &#8220;The right to the city&#8221; &#8211; what could this mean? Surely it means that people have access to basic needs like housing, clean water, and safety. But obviously the right to the city will not mean the same thing for all people and for all times. That is why we want to organize an event where we can show and debate the diversity of struggles against urban injustices. We want to get inspired by and learn from experiences of movements in the past and around the globe. 15.03.2009 The police estimated that 2500 people attended the demo (on 14th March) but the organisers claimed the the actual number was twice that. The demonstration started in Hermannplatz and moved slowly through Kreuzberg, across the river and into Friedrichshein. Towards the end some people shot fireworks of a roof and did a banner drop. The police tried to enter the building at which point people started fighting the police shaking the nearby police van and throwing rocks. After this many masked up, dug cobblestones from the streets and broke away from the demo, attacking police cars and normal cars and a McDonalds. After the McDonalds was attacked with paintbombs and rocks a police car was overturned on the intersection of Warschauer Straße and Frankfurter Allee. About 10 people were arrested and two people were injured-possibly seriously. Yesterday there was an eviction attempt by owners at Rampart. It was a long battle but we are now back in full occupancy of the building. A big thank you to all those who came out in support. We want to have as many people in the building as we can in order to discourage another eviction attempt and we are calling out for your help with this. Briefly what happened, there had been a fire the night before in the building next door to Rampart. Yesterday at 11.30am, two suited men impersonating fire brigade inspectors demanded to be allowed in to inspect the building for fire damage. They were allowed in to be accompanied around the building. Upon entering the building three security guards appeared and followed after them. The two men, who were in fact agents acting on behalf of the owners, and the guards told the Rampart member and guest present to leave but they refused. A police officer arrived at the doorway and threatened the Rampart member and guest with arrest for having crossed a crime scene (the street had been cordoned off due to the fire) and for breach of the peace if they did not leave. The member and guest again refused to leave. Finally the security guards AND the police officer violently forced both of them out of the building. Squatters have taken a large building in Clifton Village, Bristol and are currently occupying it to host a national meeting of people involved in squats and autonomous spaces this weekend. Despite attempts by builders employed by the owner to forcibly and illiegally evict the occupants yesterday, they have remained and have agreed to leave on Monday so that the meeting can go ahead. The call for a national squat meetup follows the successful gatherings in Dijon (2007), Berlin and Leeds (2008) and the days of action in defence of squats and autonomous spaces in April of last year. As the financial crisis bites with hundreds of luxury flats sitting empty millions face homelessness. As such squatting is becoming a more realistic option for many and hence the rationale for a meetup. The gathering will look towards ways of strengthening networks to resist evictions and repossessions as well as how to move forward following the successes of April 2008. If your involved/interested in squatting and/or autonomous please come along and get involved. See the blog for more details and precise location.